It’s Team Green Britain Bike Week, another of those pointless ghettoising weeks that litter the calendar, like National Doughnut Week. One week of the year when a PR company tries to place cycling stories so that everyone can forget about them for the rest of the year. Media organisations hate these sort of things and editors frequently go out of their way to ignore them. Still think it’s worthwhile? But when mainstream media awakes to the London velorution (Sunday Times above), it will not be long before councillors and mayor realise that the balance of power is shifting. And in this country, when the suits start to protest, people listen: “”there is a new breed of cyclist who wears a suit instead of biking gear who need greater protection”. He is absolutely right. If politicians think there’s a vote that could transfer to them on an issue, they’ll start listening if there’s enough votes in it. 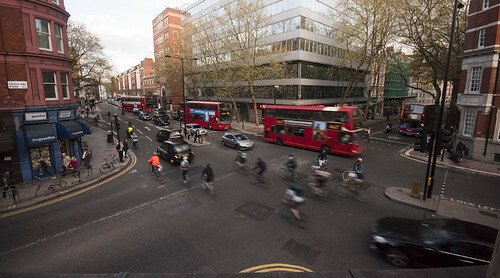 We’ve already seen anecdotal evidence of cycling facilities being an issue when choosing where to work (the Financial Times has coered this in the past but I can’t find the article) and the battle of Blackfriars Bridge is a test case for whether or not government takes the changing transport landscape seriously. So if you want to know how to change the facilities and provision for cycling where you live, make the case with numbers on the road when it matters: Monday to Friday, peak hours. This entry was posted in Advocacy, Commuting, Culture, Cycle To Work, Transport and tagged Advocacy, commuting, Critical Mass, London, politics, transport. Bookmark the permalink.